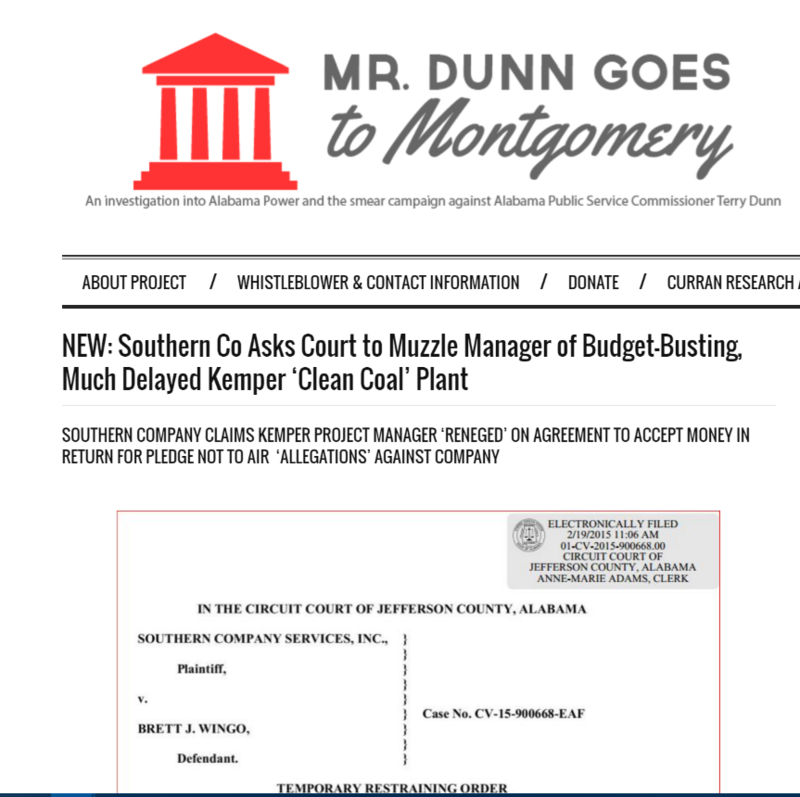 Making My Case Without This Site No Ny Times Kemper Story » Mr. Dunn Goes to Montgomery | Who's Behind the Mask? A portion of the photo of Brett Wingo that ran with the New York Times story. 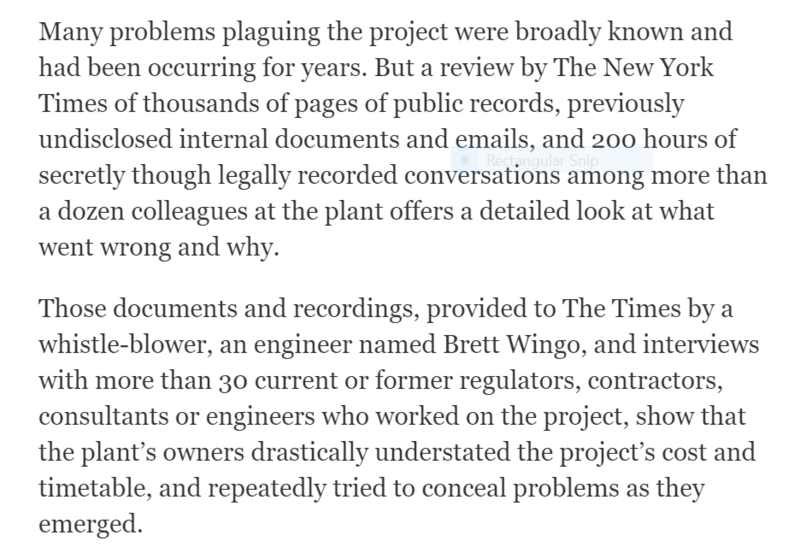 Author’s Note (July 7, 2016): This story examines the origins, on this website, of the story told by Brett Wingo and which served as the cornerstone for Tuesday’s massively detailed front page story in the New York Times about Mississippi Power and Southern Co.’s Kemper power plant. Lastly, I will suggest that the smear campaign by Alabama Power and Southern Co., against former Public Service Commissioner Terry Dunn indirectly led to the airing of Wingo’s revelations, and from there, to the damaging Times story, and possible future fallout from both. On Tuesday, the New York Times published what is unquestionably the most thorough examination yet of Mississippi Power’s budget-blasting, much-delayed and as yet still incomplete Kemper “clean coal” power plant. And that’s saying a lot. The project, which has almost tripled its projected $2.4 billion budget, has been widely covered in the national media as well as the Mississippi media. “Piles of Dirty Secrets Behind a Model ‘Clean Coal’ Project,” was written and reported by Ian Urbina. Produced might be a better word, such was the depth of the story and the supporting documentation presented with the piece. A primary theme of the story is that Mississippi Power and Southern Co., knew — and were told by their own employees — that the Kemper plant would never be completed by the publicly declared May 2014 deadline; and that top company officials chose not to disclose this to the investing public, such as through its periodic reports to the Securities and Exchange Commission. In early May, Southern Co., disclosed that the SEC is investigating “accounting matters, disclosure controls and procedures, and internal controls over financial reporting associated with” the construction of the plant. At the center of the Times story is Brett Wingo. He is a former construction manager at Kemper who clashed with management over his concerns about safety and alarms he raised regarding the accuracy of the disclosures by Mississippi Power and Southern Co. to the SEC and thus the investing public. As the story makes clear, Wingo was one of the main sources of information and internal company documents cited in the piece. The following section is near the top of the story. Wingo’s centrality to the story — obvious to anyone who reads it — is the basis for this humble suggestion: That if not for MrDunnGoesToMontgomery.Com, this fascinating story would not likely have been told, or if so, without the level of insider information that separates it from previous Kemper stories. I came across the lawsuit that was the basis of that story while researching Southern Company Services, a sister company of Alabama Power that provides over a billion dollars a year in all manner of services to Southern Company and its subsidiaries. I saw the lawsuit — or, technically, a Request for a Temporary Restraining Order — on AlaCourt, the $200 a month service that allows subscribers to search for basically every kind of court filing, civil and criminal, in every state court in ever county in Alabama. The lawsuit had been filed just days before I punched in Southern Company Services, or, another time frame for it, about a week after I’d last made such a search. This is roughly what I saw when I did, somewhat haphazardly, yet another search for Southern Company Services, as much out of boredom and recent habit as anything. I’ve been using AlaCourt ever since it was introduced, roughly in the late 1990s. If I had one indispensable source as a reporter, it was — and still is — AlaCourt. I knew, by about the second page of the court filing, that I’d happened upon a story. Among other things, the company declared that a certain Brett Wingo possessed highly confidential information that would cause Southern Co. grave damage if it became public. 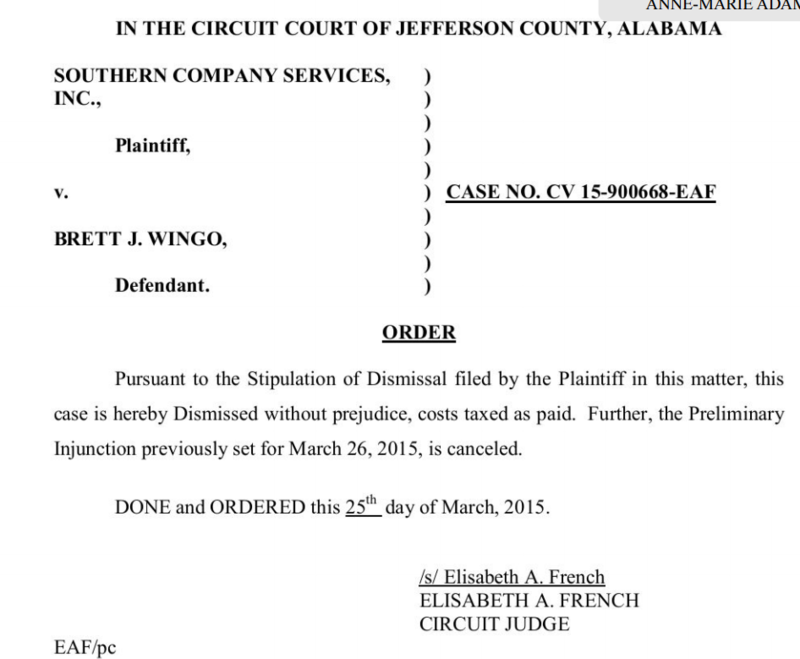 But the TRO request — brought before a Jefferson County judge — did not mention Kemper, much less Wingo’s role there. This was rectified by a Google search that revealed a resume he’d posted on a job search website and which went into substantial detail about his position at Kemper. On the night I posted the story, I got a call from Wingo, who lives in Birmingham. He’d been alerted to the piece by a neighbor who is one of thousands of people on my e-mail lists who receive notification (whether they like it or not) when I post stories. Wingo thanked me for exposing the effort to silence him. He couldn’t say more than that, such as why the company was going to such lengths to keep him from revealing what he knew. Other media followed — and — shazzam — it was soon widely known that Mississippi Power and Southern Co., were going to great lengths to muzzle one of the construction managers at the much-troubled Kemper plant. Two days later, when several reporters showed up at the court hearing for the TRO, they weren’t allowed in. The judge granted the temporary restraining order, and scheduled a hearing to consider Southern Co.’s request for a permanent order barring Wingo from discussing any aspect of his work at Kemper. Wingo told me then, and has on multiple occasions since, that if not for my story, Southern Co., would have succeeding in preventing him from telling what he knew and providing the type of documents that fueled the New York Times piece. He told me that, as soon as he was legally able, he would provide me, first, with some of the information the company had sought to keep secret. In February, almost exactly a year after the TRO drama, and after being officially terminated by Southern Co., Wingo, finally free to talk, gave me the “scoop” he’d promised, along with some of the supporting records. 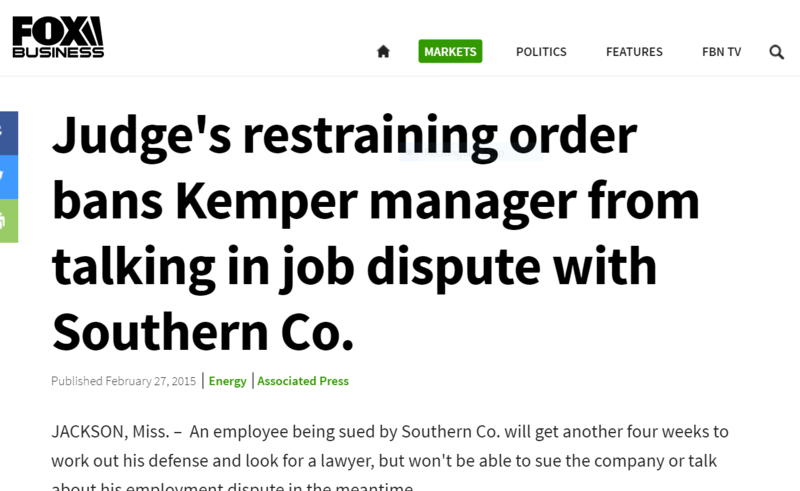 I published the story, “Wingo: I Told Southern CEO Fanning that Kemper timeline was a fraud,” on Feb. 15. Other media covered the story, though attention for my website remained a difficult tooth to pull from reporters. It seems that crediting a one-person blog/website is somehow not permitted, regardless of the accuracy of the reporting and the documentation provided in support of that reporting. Soon thereafter, Wingo told me he had been contacted by a major national newspaper. He didn’t specify which one, and I didn’t press it, but it became clear, in subsequent conversations with him, that the paper was putting an immense amount of resources into the story. This week’s story confirmed that, and more. While my efforts were not cited in the body of the story, I was pleased to see that, on two points of an accompanying timeline, the Times gave me credit. The first, and most important, is here, on what I guess would be called the “explainer panel” for a timeline entry dated Feb. 27, 2015. Not to quibble, but I wasn’t “among the first” to write about the lawsuit. I was the first, but oh well. 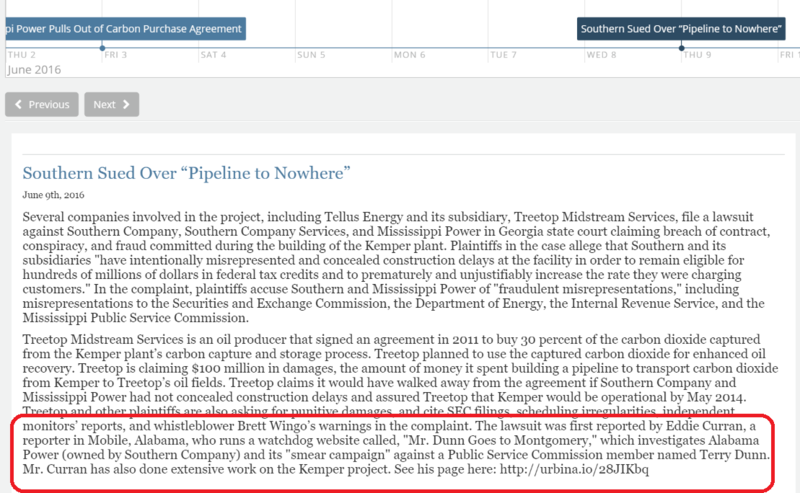 The Times also credited me/this website for one of the final entries on the timeline, regarding a lawsuit brought on June 9 against Mississippi Power and Southern Co. The plaintiffs were Treetop Midstream Services and related companies who had been under contract to purchase CO2 generated from the “clean coal” process, and who contend they have spent more than $100 million on a CO2 pipeline and related projects they say would never have spent had Mississippi Power disclosed the delays. The lawsuit, subsequently reported by numerous publications, including the Associated Press, was first reported on my site. Below, the entry on the timeline about the lawsuit and which credited this website. For me, one of the eye-opening aspects of the New York Times‘ Kemper piece had nothing to do with the subject matter, but rather, the means of telling the story. The extraordinarily long and certainly to me, fascinating report was supplemented, as noted above, by a timeline. But it wasn’t just any timeline. The items on the timeline — starting in 2002, ending at the present — were supported by well over 100 documents. Original e-mails, court filings, SEC disclosures, company correspondence, and on and on. Recordings of some of the phone calls taped by Wingo, and cited in the story, are there for the hearing. As a digital subscriber to the Times, and someone who likes seeing original documents, I was encouraged by this method of telling a story. I assume it’s been used before by the paper, and assuredly will be used again. For me, it was nothing short of a new template to tell an in-depth, multi-layered investigative news story. I will note that Wingo only provided me with a fraction of what he had, so I was able to learn a great deal from the Times article. I’m still not finished with all the records in the timeline but look forward too more reading and learning. If it’s true that the unearthing of Wingo’s allegations would never have been made if not for this project of mine — and I think it’s fair bet they would not have been — then Southern Co., has itself to blame. This web-site would not exist had Southern Co. and Alabama Power not authorized and funded — as they so obviously did — the smear campaign against Terry Dunn and, even worse, his chief of staff, David Rountree. Rountree is the “staffer” referred to in the headline below, in the Alabama Power shill publication, Yellowhammer News. Years ago, Republican PSC President Jim Sullivan hired veteran Montgomery journalist David Rountree to be his chief of staff. Later, Democrat Susan Parker hired him for the same position. After Dunn, a Republican, defeated Parker, he met Rountree, was impressed, and made him his chief of staff. Extremely knowledgeable about regulatory matters and as nice a guy as you will ever meet. That’s why elected commissioners of both parties kept hiring him. Alabama Power’s top brass — including Charles McCrary, Nick Sellers and Zeke Smith — knew Rountree well, had for years. Smiled, shook his hand, chatted with him whenever they saw him. Still, they authorized a series of attacks on him as part of their effort to tarnish Dunn and protect the company’s outrageous rate of return on equity. 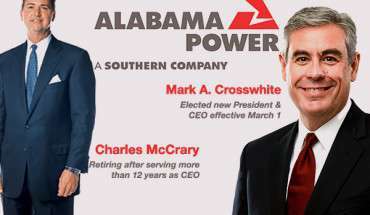 The low point came in April 2014, after Mark Crosswhite replaced McCrary as Alabama Power CEO. 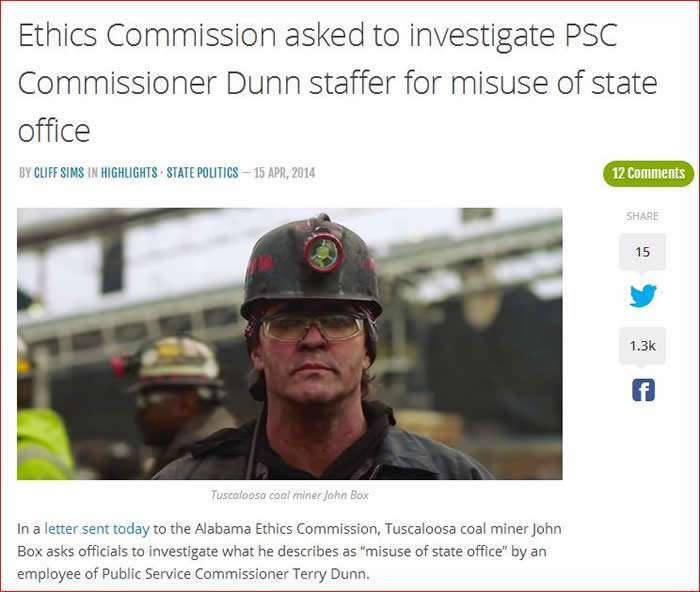 John Box, a Tuscaloosa coal miner featured prominently in media used by Yellowhammer, JobKeeper Alliance, the shill group, “Coal Jobs Count,” and other of these interconnected clown groups, filed in an ethics complaint against Rountree. A criminal complaint is another way of putting it. The complaint by Box was published in Yellowhammer News and on Coal Jobs Count’s web-site before it even arrived at the Ethics Commission. To its credit, the commission staff recognized its seedy purpose, its failure to make a case of even the slightest unethical conduct, and immediately threw it in the garbage. 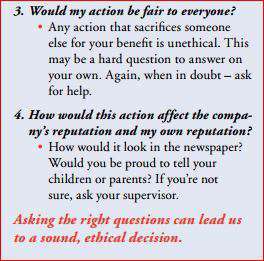 Sorry to be melodramatic, but when I get tired, and realize I’m not getting paid a dime, nor making a single friend with this effort, I think of that ethics complaint. It never fails to inspire. There is simply no excuse for a single person at Alabama Power or Southern Co., who was aware of that complaint, and allowed it to proceed, to remain employed. Terry Dunn, a three-time delegate to the Republican convention, had made enough as a businessman to retire. So he did, and ran for state office. The Public Service Commission. I don’t think he knew a lot about what the PSC did, but he soon learned. 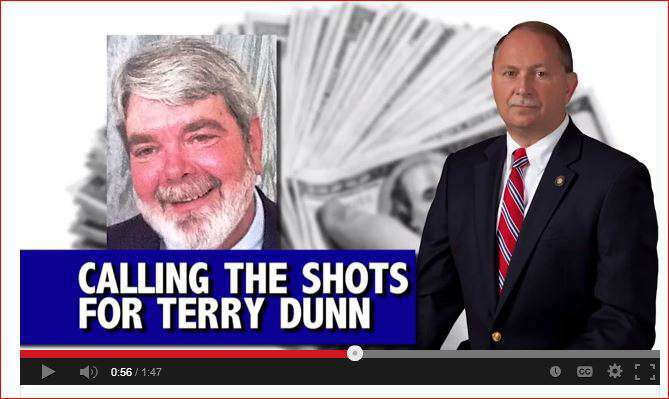 Not content to savage Terry Dunn, the ruthless, deeply unethical upper management at Alabama Power also funded and authorized attacks on David Rountree, Dunn’s chief of staff. Dunn learned, for example, that in PSCs throughout the country, a routine part of the job is holding periodic public rate hearings — actual judicial type affairs with testimony under oath and utilities compelled to publicly reveal and be forced to justify the expenditures used to support the rates they charge the public, be it for electricity or natural gas. We’re talking, par for the course, or, worse: Failure by a PSC to hold such hearings every two or three years is malpractice against utility customers and the taxpayers who fund the PSC and pay their salaries. In Alabama, there hadn’t been a rate hearing in 35 years, and for one reason: Alabama Power didn’t want them to happen. And in Alabama, the allowed Rate of Return on Equity — profit — for Alabama Power never dipped below 13 percent and some years approached 14 percent. The national average was between 9.5 percent and 10.5 percent and no other investor owned power company’s allowed profits even approached that granted to Alabama Power by the Alabama PSC. Terry Dunn, after careful consideration, decided to do what he was elected to do, which is to say, something that no commissioner in more than 35 years had dare do. He decided to do his job. Nothing more, nothing less. He called for rate hearings, and dared suggest that Alabama Power’s allowed profits perhaps should be brought down to within shouting distance of the national average. 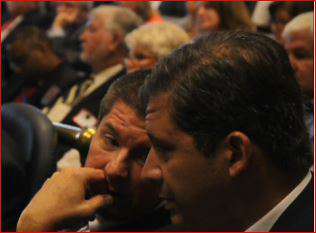 Zeke Smith and Nick Sellers confer during a PSC meeting in 2013. Smith and Sellers are the top-ranking governmental affairs executives at Alabama Power. The attacks on Dunn and Rountree could have never happened without their authorization. If board members at Alabama Power and Southern Co., are not happy with the New York Times story, these two might be worth bringing in for a Q&A session. Of course, that assumes the board members are anything more than well compensated, unquestioning supporters of whatever management tells them. Imagine if there was only one company that could sell eggs, and your state had an elected, tax-funded agency that regulated the prices for eggs, since the company was a monopoly and thus not “regulated” by the open market. Prices were set based on the company’s costs, and the profit margin allowed on its business. Consider, also, that Alabama Power is blessed with so much coal, natural gas, hydroelectric and nuclear power that only one other state exports more power than does Alabama. In other words, there are tons of chickens here, and the prices should be low as hell — instead of in the middle of the pack nationally, and with residential and business rates among the highest if not the highest in the Southeast. Alabama Power succeeded in destroying Dunn by falsely portraying him, and Rountree, as lefty environmentalists and supporters of higher rates, as opposed to what they were — advocates for lower rates. 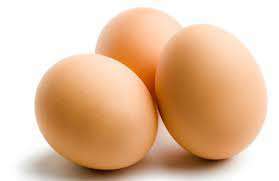 Or, in keeping with the metaphor, advocates for lower egg prices for Alabama consumers. I’d come across the legend of Joe Perkins while working on some of many stories I wrote about then Gov. Don Siegelman, with whom Perkins was quite close. 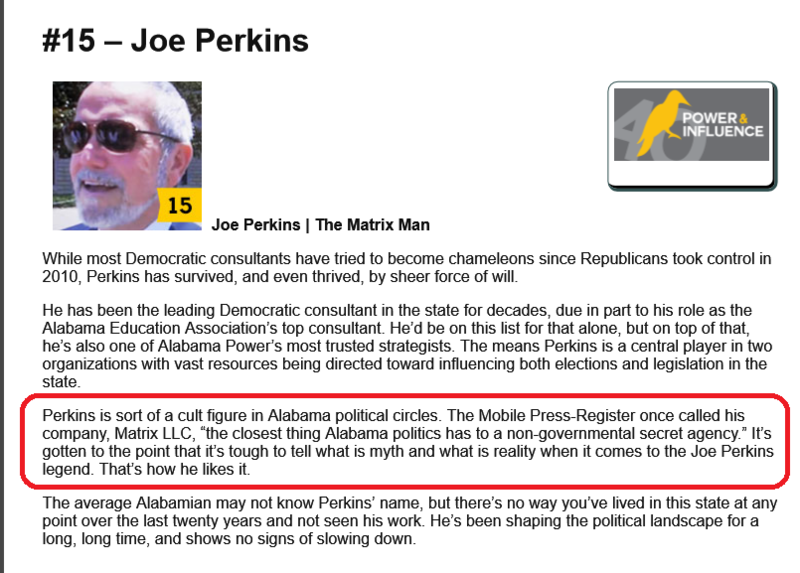 I soon learned, among many other things, that Perkins had been a close adviser/consultant to Alabama Power’s top brass for years. I had never heard of Kemper and wasn’t paying a dime’s worth of attention to Alabama politics or the Public Service Commission when, in August 2013, a Jackson, Miss.-group called the Bigger Pie Forum contacted me. Someone had praised my investigative abilities to them, but more so, recommended me because of the old story on Perkins and Matrix. Both had shown up in Mississippi in support of Kemper, and it was rumored (correctly) that both were tied to Perkins and Matrix, and had come to Mississippi in support of Mississippi Power, by way of Matrix’s long relationship with Alabama Power and Southern Co. It is too late, I’m too tired, and this is already too long, for me to repeat that tale, but it’s there if you’re interested. I’ll conclude by saying that, if folks at Southern Co. and Alabama Power agree with my thesis here — that my efforts have exposed certain activities that top company brass never thought would be exposed, and also contributed to the New York Times piece — perhaps they should consider holding accountable the executives and political consultants most responsible for the campaign against Terry Dunn and David Rountree. This website will remain active until that happens. That, I can promise. More on the way soon, hopefully tomorrow. Come back soon! 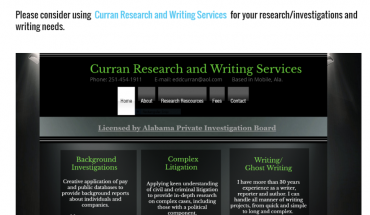 If you or your company needs in-depth research or writing services, please consider Curran Research and Writing Services.